Note : The cache is factory installed and can not be altered. 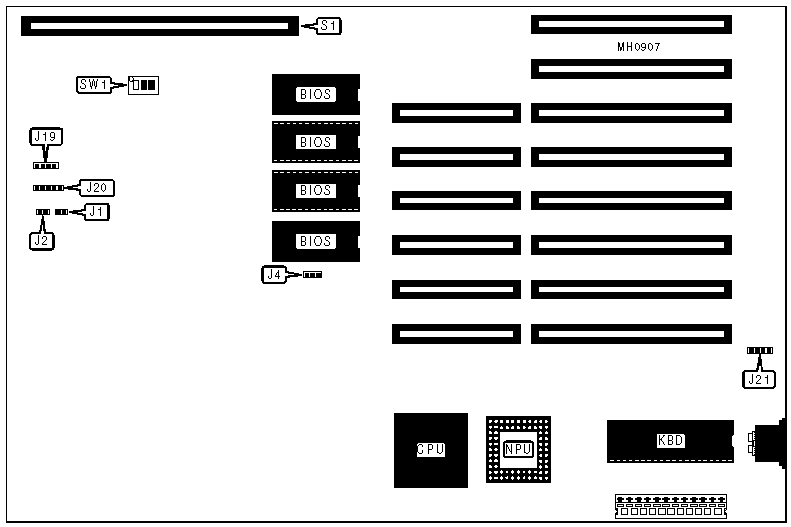 The size and location of the cache and tag chips are unknown. Note: Each system memory card can be connected to a daughter board, for an additional 4 to 8MB of memory. The daughter board's Strips J2 & J3 (component side) plug into the J2 & J3 Strips (solder side) on the system memory boards. Note: The system memory card must be filled to maximum capacity (2MB) to implement the daughter board. When the daughter board is plugged into the system memory board the switches previously used to set the base memory size on the system memory card is then used to set the base memory size of the daughter board. Note: The system memory card must be filled to maximum capacity (8MB) to implement the daughter board. When the daughter board is plugged into the system memory board, the switches previously used to set the base memory size on the system memory card are then used to set the base memory size of the daughter board.